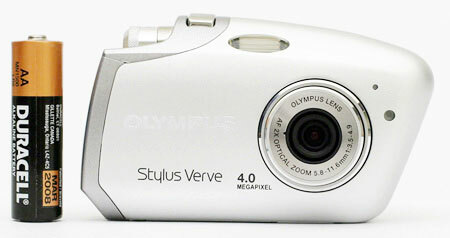 The Olympus Stylus Verve (known as the µ-mini in Europe) is sure to turn a few heads with its strangely-shaped ultra-compact metal body. The camera is weatherproof and available in 6 different colors. It offers a 4 megapixel output with a 2x optical zoom lens. The Stylus Verve is a point-and-shoot camera with 14 preset shooting modes, including the usual Auto, Portrait, and Landscape modes as well as some additional modes like Cuisine, Candle, and Sunset. In our review, we discovered that although the Stylus Verve gets plenty of attention for its appearance, its performance is not quite as impressive. The camera has decent resolution, color reproduction, and is capable of producing well-balanced exposures. However, the major downfall of the Stylus Verve is the visibility of jaggies in its output images. In regard to speed, the Verve is only mediocre. The startup, shutter lag, and write times are all equal or slightly below average. The camera has a maximum aperture of f/3.5. This means that low-light shooting is very difficult - especially without an AF-assist lamp. Read on for more details of our review of the Stylus Verve.